Well it’s been a long time since we’ve gotten any info from Disney, but late last night the Events page informed us of a lot of new things, coming in just 8 days! First off: Everyone in California, once again the WDW 40th Anniversary will be delayed another week. That means that this Friday (the 4th) California D-Street will only be releasing Cutesters Too and the Holiday 2 9″ Cupid. On the 11th they will be getting the WDW 40th Anniversary. On February the 11th both coasts will be releasing three things. Second, the Urban 5 9″ Orange Gear Bear will be released that day. This is the first 9″ gear bear, I wonder how it will sell. This bear was designed by Maria Clapsis (not Dan Howard who usually designs the gear bears) and is LE of 600. And third, the Urban 5 9″ Bacon will also be released. 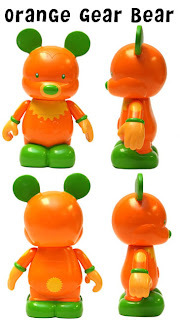 This vinylmation is by Thomas Scott and is a limited edition of 600. Who’s got eggs?